Adhesive Labels for Bins - 2 5/8" x 7/8"
Already bought our bins but need a way to label them? 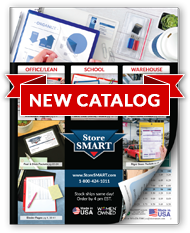 Use StoreSMART's Adhesive Labels! Each label is 2 5⁄8" x 7⁄8" and comes 20 labels per sheet. Each pack includes 10 sheets, for a total of 200 labels. With a strong acrylic adhesive backing, you don't have to worry about your labels falling off. Label Size: 2 5⁄8" x 7⁄8". Permanently bonded in 40 to 72 hours. Note: large, heavy items (whiteboards, utility carts, storage bins, tables, etc.) cannot ship with our smaller, lighter items (plastic pockets, folders, magnets, etc.). They must be ordered separately. Thank you.